Mazda Certified, ONLY 17,581 Miles! FUEL EFFICIENT 24 MPG Hwy/17 MPG City! NAV, Heated Leather Seats, 3rd Row Seat, Sunroof, Back-Up Camera, iPod/MP3 Input, Bluetooth, Alloy Wheels, GT TECHNOLOGY PACKAGE, Rear Air SEE MORE! Leather Seats, Third Row Seat, Power Liftgate, Rear Air, Heated Driver Seat, Back-Up Camera, iPod/MP3 Input, Bluetooth, Aluminum Wheels, Keyless Start, Dual Zone A/C, Blind Spot Monitor, Cross-Traffic Alert, Heated Seats, Heated Leather Seats. Rear Spoiler, MP3 Player, Remote Trunk Release, Privacy Glass, Keyless Entry. GT TECHNOLOGY PACKAGE Bose Centerpoint w/10 speakers, SiriusXM Satellite Radio, 4-month subscription, Recreational Accessory Package, Roof Rack w/Roof Rails, Cargo Netting, Rear Bumper Guard, Navigation System w/Real Time Traffic, Power Sliding Glass Moonroof w/Interior Sunshade, one-touch open/close. 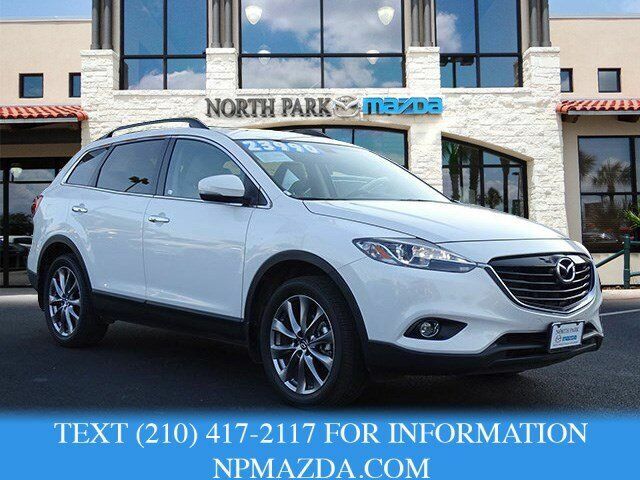 Mazda CX-9 Grand Touring with CRYSTAL WHITE PEARL MICA exterior and SAND interior features a V6 Cylinder Engine with 273 HP at 6250 RPM*. Edmunds.com explains "With its second and third rows folded flat, the CX-9 offers up a formidable 101 cubic feet of cargo capacity: an excellent figure for this class.". Great Gas Mileage: 24 MPG Hwy.